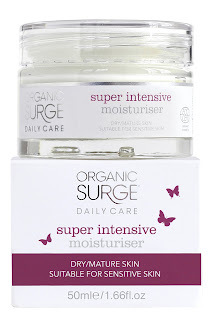 For seriously dehydrated skin, be it through winter, lifestyle, health or ageing this all natural and organic super intensive daily moisturiser nourishes, conditions and rehydrates very dry skin. With a velvety rich texture, Organic Surge Super Intensive Moisturiser (€16.99) has a really luxurious feel that leaves skin looking plumper and feeling really hydrated. For skin that needs an extra surge of moisture this intensely hydrating cream is packed with natural humectants for the ultimate boost to restore dryness. The natural ingredients include organic rose geranium essential oil and aloe vera to restore skin balance, revive a dull complexion and give your skin all the nourishment it needs. Skincare doesn’t get any better than Organic Surge! This new affordable organic skincare range is the real deal - impeccable certified-organic credentials, exceptional quality formulations loaded with skin goodness and a comprehensive range of daily and extra care products for every skin type and skin concern. With an army of high profile celebrity fans including Tamsin Outhwaite, Lisa Eldridge, Angellica Bell, Rosie Fortescue, Katie Piper and Sian Welby – Organic Surge cleverly brings organic skincare to the mainstream with its multi-award winning collection of skin care treats at affordable and accessible price points. • Pure plant extracts and fragrant essentials oils. • Rigorous testing - clinically and dermatologically tested and suitable for sensitive skins. • Cruelty free - Organic Surge is against animal testing and all products are suitable for vegetarians, most products are suitable for vegans also. • Parabens, Sodium Lauryl / Laureth Sulfate (SLS) Sodium Lauryl Ether Sulfate (SLES). • Artificial fragrances, colourants and genetically modified ingredients. And we test only on our staff and industry professional friends - not on animals!. • Mineral oils, petroleum, propylene glycol, lanolin. • Phthalates, DEA, TEA, and MEA. • All products are Ecocert certified and contain a minimum of 96% naturally derived ingredients. • Ecocert is the global leader in Organic Cosmetics with more than 70% of market. • Ecocert defines requirements superior to the ones defined by the European Regulation that guarantee respect for the environment, respect for the consumer and enhancement of natural and organic substances. • The basic principles of the Ecocert standard are to ensure an environmentally friendly cosmetic product with a minimum threshold of natural ingredients from organic farming to be reached to obtain certification. You can now pick up Organic Surge products at Allcare pharmacies in Dublin, Cork, Kildare and Louth. For additional stockist enquiries contact Blue Sky Products on (01) 4610645. Hi, Great post. I like the way of your writing. After read this blog, I am planning to start taking organic skin care products. Let me know how to find difference between organic and conventional products? Thanks for sharing useful information. Keep blogging.